1. Configure a standard IP access list to prevent all machines on network 172.16.0.0 from accessing your Ethernet network. 2. Apply the access list to your Ethernet interface. 3. Create an access list that denies host 196.22.15.5 access to your Ether- net network. 4. Write the command to verify that you’ve entered the access list correctly. 5. Write the two commands that verify the access list was properly applied to the Ethernet interface. 6. Create an extended access list that stops host 172.16.10.1 on Ethernet 0 from telnetting to host 172.16.30.5 on Ethernet 1. 7. Apply the access list to the correct interface. 8. Configure an IPX SAP access list that prevents any file service SAP messages other than those from IPX address 45.0000.0000.0001 from leaving the Ethernet 0 network. 9. Apply the IPX SAP access list to the Ethernet interface. In this section, you will complete three labs. To complete these labs, you will need at least three 2500 series routers, or the RouterSim product. All of the labs will use Figure 9.3 for configuring the routers. In this lab, you will allow only Host B from network 172.16.30.0 to enter network 172.16.10.0. Go to 2501A and enter global configuration mode by typing config t.
Choose an access list number that will allow you to create an IP standard access This is a number between 1 and 99. Test your access list by pinging from Host B (172.16.30.2) to Host A (172.16.10.2). Ping from 2501B and 2501C to Host A (172.16.10.2); this should fail if your access list is correct. In this lab, you will use an extended IP access list to stop host 172.16.10.2 from creating a Telnet session to router 2501B (172.16.20.2). However, the host still should be able to ping the 2501B router. IP extended lists should be placed closest to the source, so add the extended list on router 2501A. Remove any access lists on 2501A and add an extended list to 2501A. Choose a number to create an extended IP list. The IP extended lists use 100–199. Use a deny statement (you’ll add a permit statement in step 7 to allow other traffic to still work). Add the source IP address you want to filter on, then add the destina- tion host IP address. Use the host command instead of wildcard bits. At this point, you can add the eq telnet command. The log command can also be used at the end of the command so that whenever the access-list line is hit, a log will be generated on the console. It is important to add this line next to create a permit statement. Apply the access list to the Ethernet 0 on 2501A to stop the Telnet traffic as soon as it hits the first router interface. 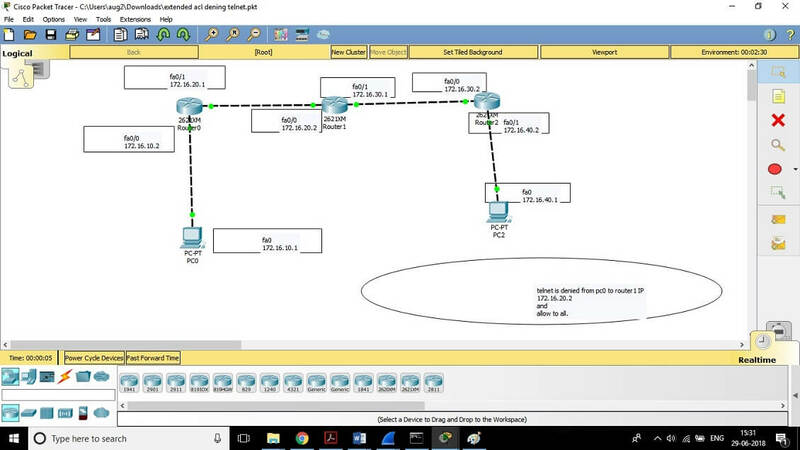 In this lab, you will configure IPX to allow only IPX traffic from IPX Net- work 30 and not from IPX Network 50. Remove any existing access lists on the 2501A router. Because this is an IPX standard access list, the filtering can be placed anywhere on the network since it can filter based on IPX source and destination IP addresses. Verify that you have the IPX network working as shown in Figure 3. 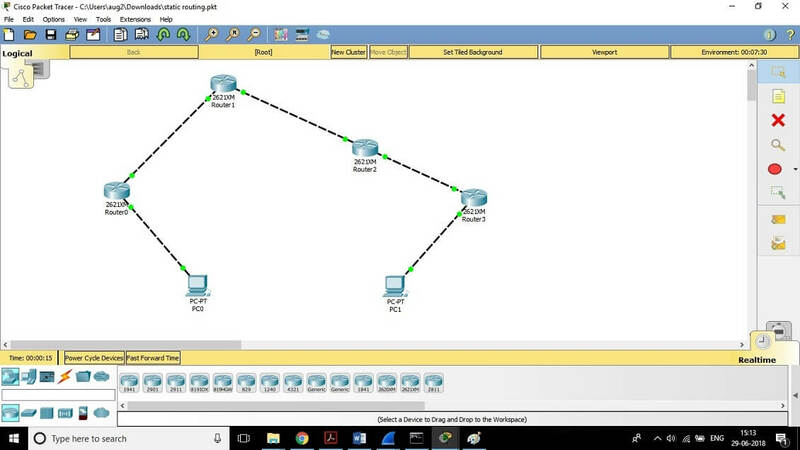 Use the show ipx route command to see all networks on your routers. 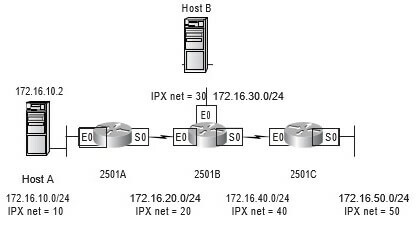 Configure an access list on 2501A to allow only IPX traffic from Net- work 30 and to deny IPX Network 50. IPX standard lists use the access list numbers 800–899. First, deny IPX Network 50, then permit everything else. The –1 is a wildcard in IPX. Verify the list by looking at the IPX routing table. Network 50 should not be in the 2501A IPX routing table. Also, use the show access- list and show ipx access-list commands to vary the list. 1. IP standard access lists use which of the following as a basis for permitting or denying packets? 2. IP extended access lists use which of the following as a basis for per- mitting or denying packets? 3. To specify all hosts in the Class B IP network 172.16.0.0, which wild- card access list mask would you use? 4. Which of the following are valid ways to refer only to host 172.16.30.55 in an IP access list? 5. Which of the following access lists will allow only WWW traffic into network 196.15.7.0? 6. Which of the following commands will show the ports that have IP access lists applied? 7. What wildcard would you use to filter networks 172.16.16.0 through 172.16.23.0? 8. Which of the following is a valid IPX standard access list? 10. Which of the following commands will apply IPX SAP access list 1050 for incoming traffic, assuming you’re already at interface configuration? 11. Which of the following commands will show extended access list 187? 12. What is the IP extended access list range? 13. Which of the following commands is valid for creating an extended IP access list? 14. What is the extended IPX access list range? 15. What does the –1 mean in an extended IPX access list? 16. What are three commands you can use to monitor IP access lists? 18. Which access configuration allows only traffic from network 172.16.0.0 to enter int s0? 19. Where should you place standard access lists in a network? 20. Where should you place extended access lists in a network?